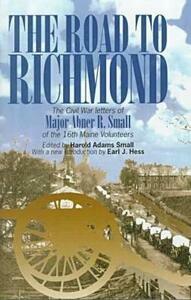 The Road to Richmond: The Civil War Letters of Major Abner R. Small of the 16th Maine Volunteers. 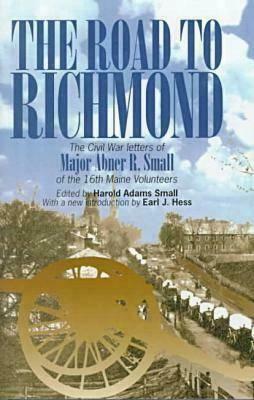 Abner Small wrote one of the most honest, poignant, and moving memoirs to come out of the Civil War. He served as a non-commissioned officer in the Third Maine Infantry during the summer of 1861, experiencing battle for the first time at First Bull Run. As a recruiting officer, he helped to raise the Sixteenth Maine Infantry and served as its adjutant. The Sixteenth Maine gained fame for its heroic delaying action on July 1 at Gettysburg, where it lost 180 of its 200 men. It went on to serve in Grant's Overland Campaign in Virginia. Small was an articulate observer of all this. He wrote his memoirs with a keen sense of the irony of life during wartime, and with a gift for expression. His descriptions of the dead at Gettysburg, his characterizations of famous men such as Major General Oliver Otis Howard, and his reflections on the emotions of men under fire are outstanding. Small was captured in the battle of Globe Tavern on August 18, 1864. His account of prison life at Libby, Salisbury, and Danville is gripping. Small was exchanged just in time to lead his regiment in the final days of the war. His book reveals more of the inner soldier than almost any other account written by a Union veteran.